1. 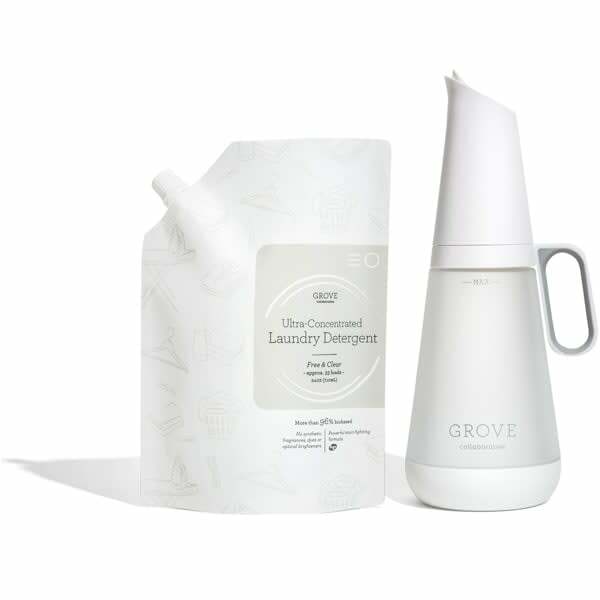 Use Grove laundry essentials for clothes that bring you joy. 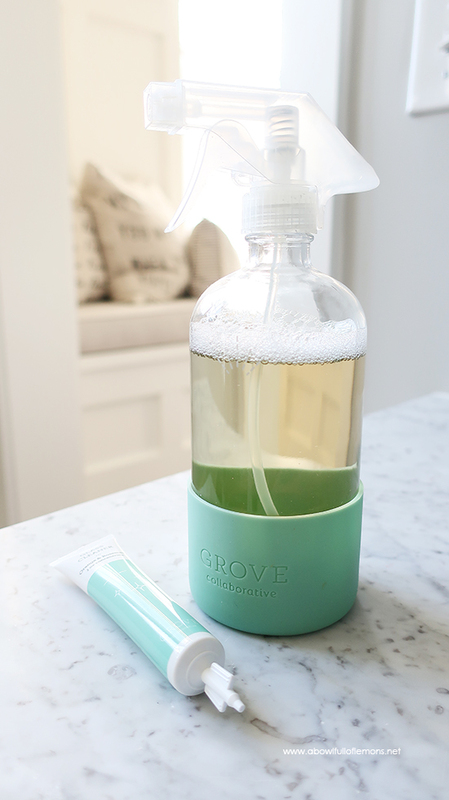 There’s no better way to bring you joy than by trying out the brand new eco friendly laundry detergent and glass dispenser from Grove. The dispenser is auto-dosing which makes laundry day so much easier. The detergent is dye-free and uses natural cleaning enzymes to tackle dirt and stains. You’ll love the fresh smelling citrus & woods scent or if you prefer, you can get it in free & clear. 2. Corral supplies into the enamel Grove caddy for tidying. 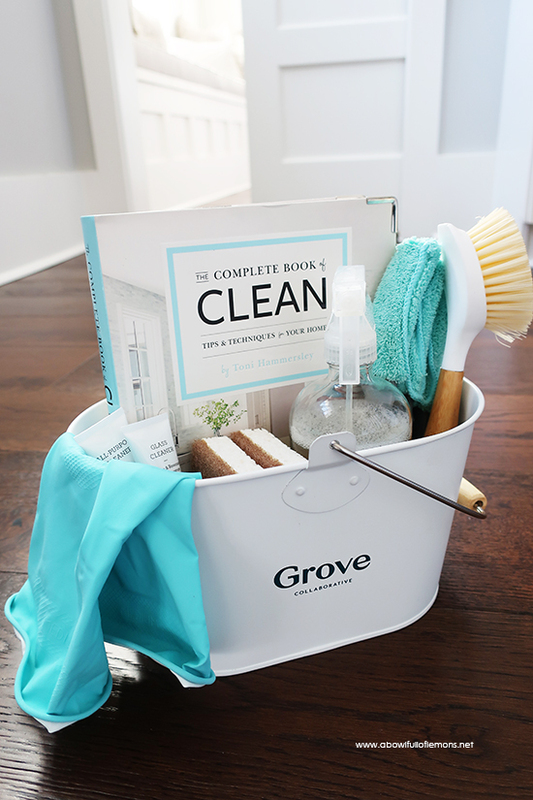 The iconic Grove caddy can be used to tidy just about everything in your home. I use mine to tidy cleaning supplies. You can also tidy toys, garden supplies, or make-up. The sky is the limit. *This caddy is FREE right now. See below. 3. Store your Grove products in categories. Marie Kondo is all about storing similar items together and I couldn’t agree more. 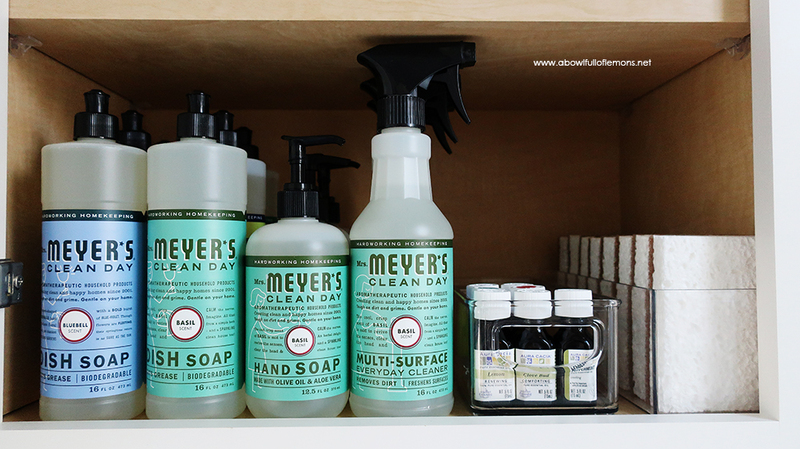 I store my Mrs. Meyers cleaning products, essential oils, and walnut scrubbers (all from Grove) in my laundry room cabinet. Being organized eliminates the need to search for things. Who has time for that anyways? 4. Store drawer contents vertically. Marie Kondo’s signature way to store items in a drawer is to stand them up vertically so you can see them. This also gives you the most space within that space. 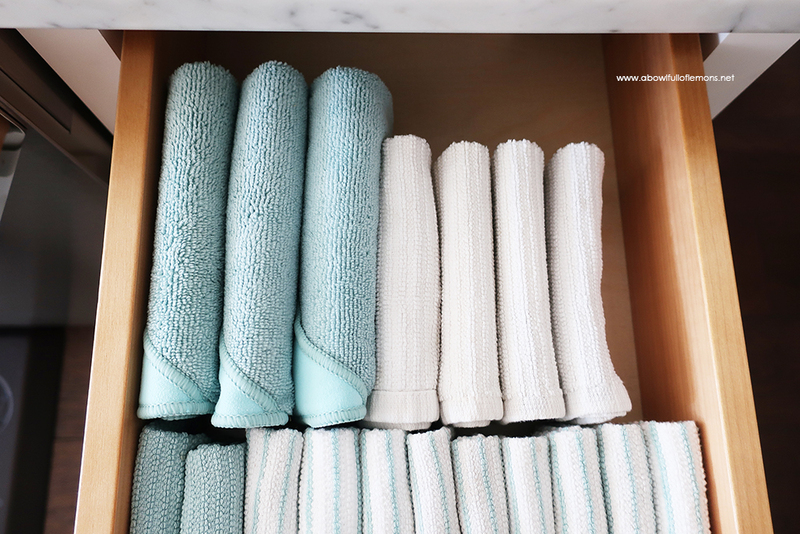 I love Grove’s all-purpose microfiber cloths and they fit wonderfully when stored this way. 5. Switch plastics for glass to rid your home of clutter. Marie Kondo’s number one philosophy is to rid your home of clutter. Eliminating the need to purchase one-time use items such as plastic bottles is a huge step towards this goal. 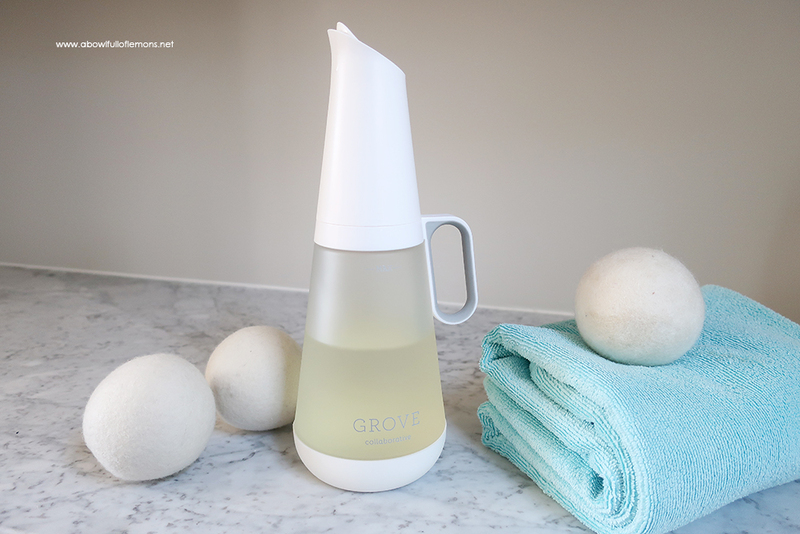 Grove offers stylish glass spray bottles with silicone sleeves that are designed for their cleaning concentrates. Just add water and you are on your way to a clean and clutter free home. See something you like? 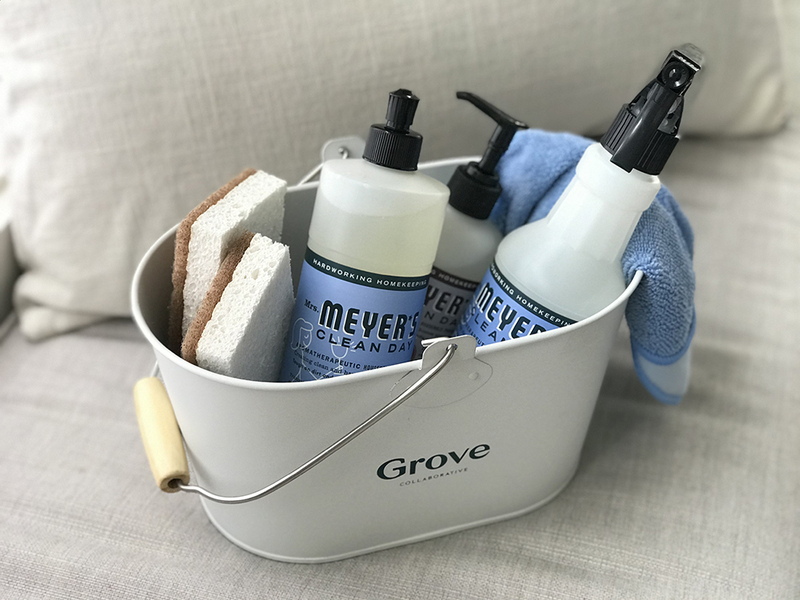 All new Grove customers who spend at least $20 (easy to do with so much to choose from) will receive a Grove caddy filled with 3 Mrs. Meyers cleaning products, 2 walnut scrubbers, and free shipping. Get all of this for FREE, when you spend at least $20 on your first order. *Microfiber cloth not included. This laundry detergent & dispenser costs $24.95 together. By purchasing the set below, you will get everything above for FREE!!! 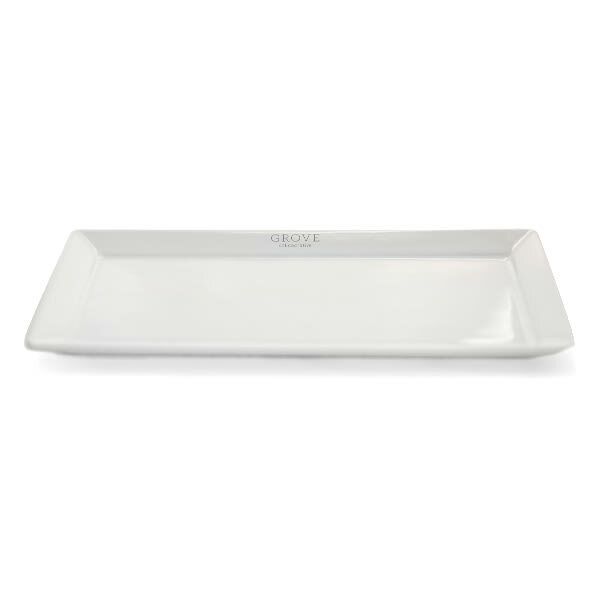 Bonus: If you spend $39 today, you’ll get a beautiful stoneware tray for free (in addition to the Grove caddy, Mrs. Meyer Trio, and sponges)! It’s perfect for corralling dish soap and a sponge to keep your countertops tidy.